I’ve had alopecia, off and on, for 35 years. What started out as three decades of mild alopecia areata (intermittent bald spots that grew back quickly), ended up becoming a full blown case of alopecia ophiasis, where I became one-third bald. But with a lot of work, I grew my hair back and I’ve kept it. I teach my clients the same exact strategies that I used. I know hair loss. And I know how to reverse it safely. I’ve been working with hair loss/alopecia clients since early 2014 with great success. This story features one of my clients—and one of my proudest experiences as a nutrition and hormone coach. You can go here to read testimonials from my summer 2018 Reversing Alopecia masterclass participants and go here to read testimonials from some of my private coaching clients. Reversing hair loss is an inside job. Drugs, steroids, creams, injections, and immunosuppressants are not the answer. But I put my heart and soul into this guide. I didn’t just slap it together to have “something” for that event. For the Nutrition chapter, I really spent a lot of time researching specific nutritional support for hair follicle health and hair growth, which I loved doing because I take a “food first” approach to most things. The guide includes information on specific nutrients for follicle health and hair growth, reasons for loss, increasing scalp circulation, and the (largely forgotten) hormonal factor, among other topics. << Enter your name and email up and on the left to receive my free guide to slowing hair loss and resignaling hair follicles. 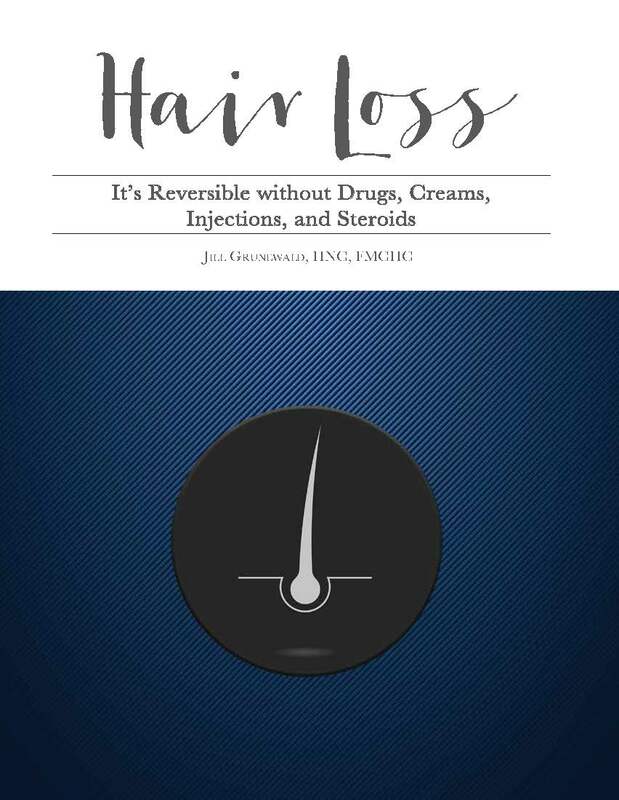 Please enter your name and email to receive my guide, Hair Loss: It’s Reversible without Drugs, Creams, Injections, and Steroids. We hate spam too. We'll never rent or sell your email address. My biggest regret was not meeting Jill three years sooner. I believe I could have avoided thyroid medication altogether. With just a few changes - that weren’t as hard as I thought - I am feeling much better!